Yesterday, my mum and I headed into town for the last Gilles Street Market of 2009. I must admit, I don't often find very much (if any) vintage of the eras that I love so I was fairly confident that I would come away relatively unscathed in the bank department. The reality? Far from my expectations. 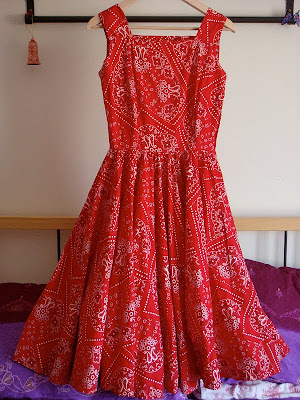 This lovely 1960s day dress cost me 60$. It was marked as 65$ but the top button was missing (it had been ironed in such a way that I feel was meant to disguise the missing button) so the woman I bought it from knocked off 5$. There's something very familiar about this dress and I'm sure I've seen one similar some place or another. It happens to fit me perfectly, too. 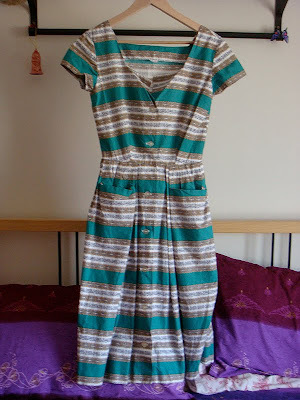 Then there's this 1950s circle dress. This also fits me perfectly and is absolutely divine. It cost 100$. My initial thought was that it was completely overpriced but, as I walked around, I couldn't stop thinking about it and knew I had to at least try it on. Unfortunately, as I said, it fit perfectly and I knew there was no way I could go home without it. So, I'm significantly poorer (or, more accurately, deeper in debt to my wonderful mother) but very pleased with myself, at least. Now, I don't usually mention the price of things I buy but I've been thinking about the cost of vintage quite a bit, lately, and was thinking of writing a post about it. Is anyone interested? I was thinking of just writing about my own experiences and then get everyone else to maybe tell me about theirs. Outfit details: sunglasses - ? ; beaded necklace - Fisherman's Wharf Markets; 1960s N.O.S. dress - Red Ruby Vintage; shoes - Rubi Shoes. I've also just realised that I received another blog award, from Melanie of Pink Champagne for Dancing. What I'm meant to do is pass it on, but what I'm going to do instead is tell everyone to check out Melanie's awesome blog, which she started only last month, I think. She's a very stylish lady and very sweet, too. Oooh, great buys! Those dresses are both so pretty! i'm in love with the red one! Such pretty finds Andi! I will have to check out that market next year. Oh the red one is very pretty! I almost hate finding clothes and not wanting to try them on because then you HAVE to buy it!! Yes, vintage clothing is getting real expensive these days... one of the reasons I started improving my sewing. Please share your thoughts on the issue! I love that 1960s dress with the white accessories. So cool! I think the subject of vintage pricing is rather interesting - and if one is interested in collecting those items, it's good to have an awareness of the methods stores use to price items. Being savvy about it can help you get some good bargains. I hate it when i fall in love with a dress, nothing on earth can stop me from buying it! The blue dress looks lovely on you. Oh wow--both of those are gorgeous finds, Andi! I just love the first one; the cool colors and horizontal stripes are so elegant. Not to encourage, but both were definitely worth being a bit poorer for. ;) hehe! I'd definitely be interested in reading your thoughts on the price of vintage! I have my own thoughts about it, and am always eager to know what others think too. Great finds! I love the stripy one. They are both gorgeous! Very pretty dresses Andi and I too would like to know your thoughts on vintage pricing. 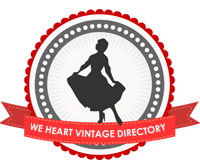 I would love to read your thoughts pertaining to the pricing of vintage fashion and welcome any posts on such a topic that you'd like to share with us, honey. Definitely interested in a post on the price of vintage! 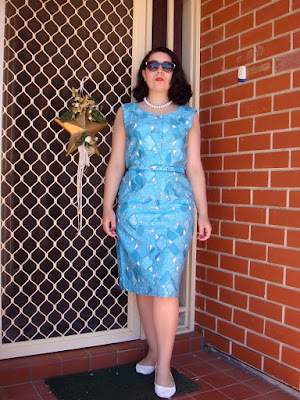 I often come across frocks that are laughably overpriced for the quality, and I worry that people who don't have a particularly comprehensive understanding of the different eras etc will think it's worth it! I think a post on vintage pricing would be excellent too! I know a lot of blogs go on about buying vintage but there doesn't seem to be too much transperancy on how much everything costs. So for a newbie it can be a tough field to navigate.